Labour shortages in Canada are projected to reach close to two million workers by 2031, costing the Canadian economy billions in lost GDP annually. Additionally, rising rates of absenteeism, presenteeism, and turnover are now requiring employers to use innovative ways to recruit and retain a qualified labour force. Most people living with a mental health problem or illness want to work and can make important contributions to the workforce if they are adequately supported. 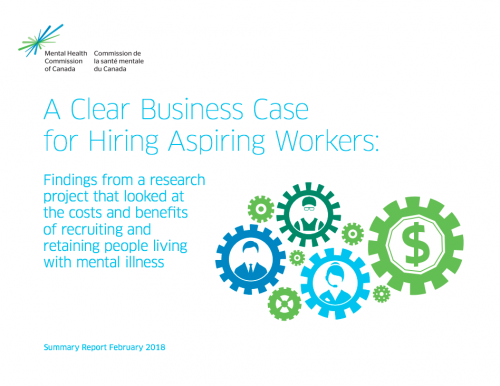 This report presents the business case for employers to actively recruit and accommodate people living with a mental illness through an in-depth examination of the financial, social and organizational costs and benefits. The focus is on Aspiring Workers, those people who, due to mental illness, have been unable to enter the workforce, who are in and out of the workforce due to episodic illness and are struggling to remain in the workplace, or who wish to return to work after a lengthy period of illness. Five Canadian businesses that have championed workplace mental health and taken active steps to hire and support the Aspiring Workforce were selected to carry out the research. Within each organization researchers spoke to a diverse group of stakeholders, including workers living with serious mental illness, co-workers, managers, human resource professionals, and individuals who have championed hiring and supporting people living with mental health problems and illnesses.